Standing on the edge of the caldera looking across to the Western rim over Doon Doon. We live in an ancient landscape on the edge the Tweed volcanic caldera – one of the largest and best examples of an erosion caldera in the world – with various volcanic plugs still visible throughout the area – the largest of which is Wollumbin (Mt. Warning) – which would have been twice as high as it is today before it blew it’s top over twenty million years ago. I am lucky to have as the backdrop to my garden another of these volcanic plugs – Mt. 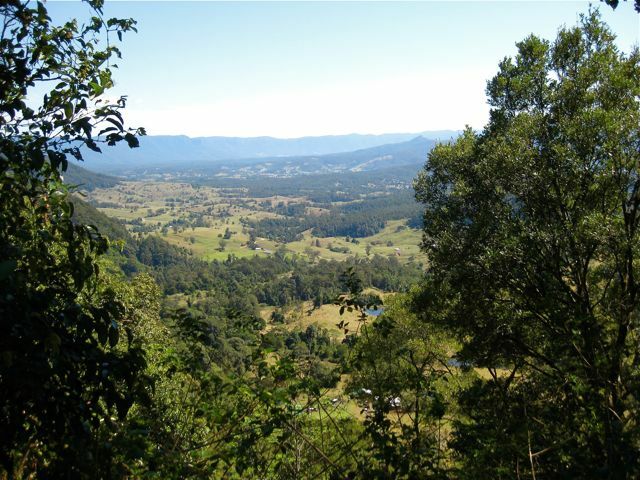 Chincogan, and be able to see Wollumbin in the distance over to the West. In aboriginal mythology Wollumbin is the father and Chincogan the mother – protectors of the land – watching over all living creatures and it’s sacred places.For many thousands of years this green paradise, resting in the shadow of the majestic Wollumbin, was home to the aboriginal Bundjalung people. The Bundjalung enjoyed a warm sub-tropical climate. 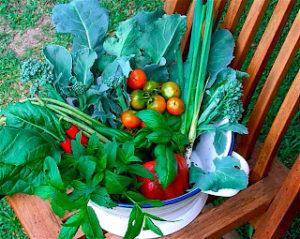 The landscape varied from towering mountains to the bountiful sea, providing an abundance of food and materials that met all their needs. 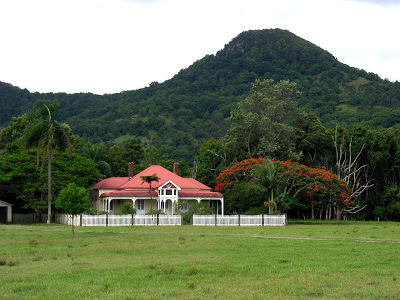 Wollumbin, the mountain named by Captain James Cook as Mt Warning, towers 1100 metres above the sea. It was named by Cook in 1770 as a warning to other seafarers of the numerous treacherous reefs along this coast. 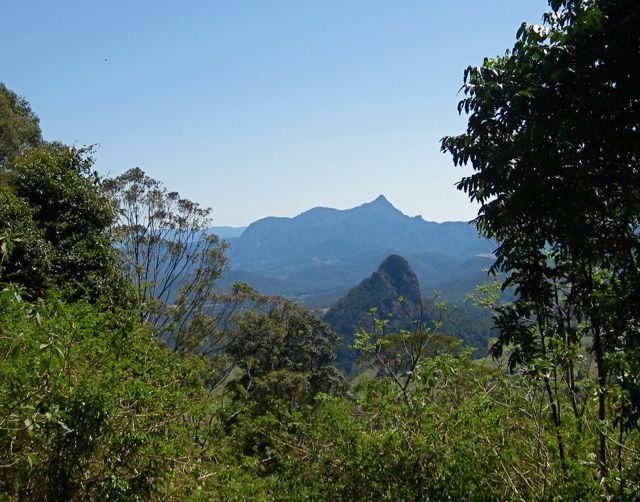 He did not know that the Bundjalung people for many miles around called the mountain Wollumbin, and that it was an important sacred site, as their lives and religion were strongly linked to the land. Whenever you walk in the forests around here you come across enormous felled trees like this – discarded by the loggers because, once cut down, they discovered them to be hollow inside. Following explorations by Cook, white settlement began – and, consequently, the displacement of the Bundjalung forever. In the 1850’s a British timber logging camp was built at the back of Mullumbimby – the start of white settlement in this area. A place where the cutters could feed their livestock on the grasslands and get their valuable timber down the Brunswick River and out to the waiting ships – taking the rainforest timber, mainly red cedar, back to the UK. 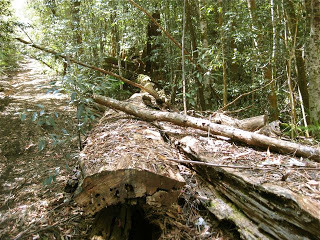 Fortunately, these remnant forests are now protected and part of the Jerusalem, Nightcap and Wollumbin National Parks system – fought hard, and long for by locals and environmental campaigners. 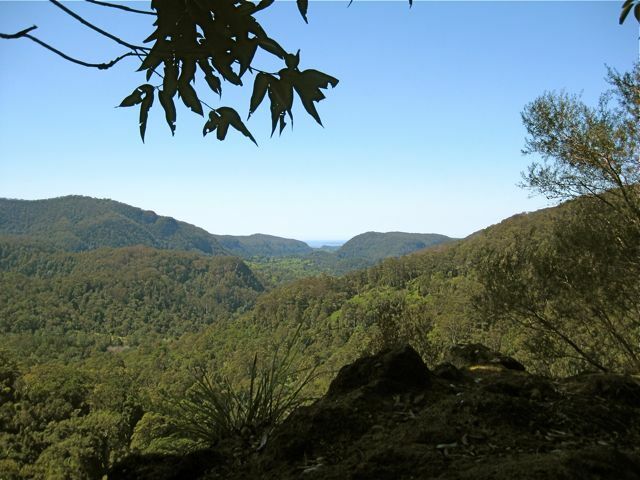 Once up here, and taking in the magnificent views, you only have to step over to the southern side of the rim and walk for about ten minutes to get wonderful views the other way, down the Wilsons River Valley to the Byron Bay Lighthouse. The walk takes you under towering cliffs, through lush vegetation of palms, orchids, ferns and huge eucalypts to Meditation Rock – where you just have to pause for a while to enjoy the sweet air, smell springtime and listen to the birds. 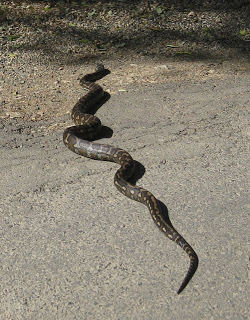 In five hours we didn’t see one other person – just this fellow – a diamond backed python. He was a small one – only about 2 metres long!